Nu-Blu: (from left) Daniel Routh, Carolyn Routh, Levi Austin, Kendall Gates: Ready to hang around for awhile. When the lamented Pinecastle Records closed up shop last year, the North Carolina quartet Nu-Blu was part of the collateral damage. The band had its first album in the can and was awaiting its release at the moment the business ceased operations. 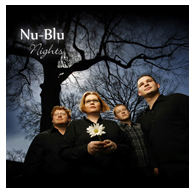 But Nu-Blu is a resilient bunch, and the demise of their label was merely a bump in the road, and nothing compared to what had happened six years earlier. 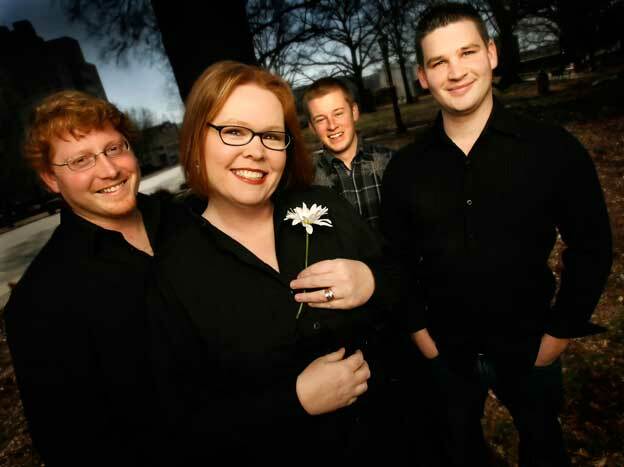 It was in 2003 (the year Nu-Blu was formed) that bass player/vocalist Carolyn Routh suffered two strokes in succession over Thanksgiving weekend and lost both her ability to speak and the use of her right side. Guitarist/vocalist Daniel Routh stuck with her throughout recovery and rehab, as she slowly regained everything the stroke had robbed her of, with Daniel’s enduring love as an added-value bonus. In 2006 the couple was married. So a label folds? Piffle. The Nu-Blu debut album is out as a self-released project, and it’s not merely good, it’s a blessing for fans of traditional bluegrass. These musicians—in addition to Daniel and Carolyn, the lineup is rounded out by a super mandolin player in Kendall Gates and a formidable, subtle banjo man in youthful looking Levi Austin, a former North Carolina State Banjo champ—play with an assurance and verve that is the product of discipline, hard work and, ensuing from those attributes, an understanding of the group dynamic reflected in precision technique and galvanizing communication among the instrumentalists. Beyond the sparkling musicianship, the original material has poetry and craft going for it, the well-chosen covers (from writers on the order of Nanci Griffith and Mark Brinkman) fit right in, and vocally the Rouths make a strong impression—Daniel has a warm, husky tenor, full of feeling, and Carolyn a strong, ringing, mountain timbre and a smooth pop edge all at once—kind of a combination of Rhonda Vincent and Alison Krauss, if comparisons must be made. The common bluegrass album kickoff number gets a makeover here. Instead of the time-honored barnburner, Nu-Blu opens with Greg Luck’s midtempo breakup missive, “I Won’t Be Around,” a showcase for guest Luck’s steadily crying fiddle and a continuously rolling banjo statement by Austin supporting Daniel’s forceful lead vocal and the Rouths’ soaring harmonies on the choruses. Love, especially of the troubled kind, is a recurring theme on Nights. It’s there in the confusion permeating Carolyn’s plaintive vocal on her and Daniel’s multi-textured ballad, “How Do I Move On”; it’s there in the anticipatory tension of another Rouths original, the lilting “In and Out of Love”; it’s there when the barnburner does show up by way of Mark Brinkman’s “Try and Catch the Wind,” on which the band shoots out of the gate at a frantic pace led by Austin’s banjo and Luck’s breakneck fiddling, with Daniel adding a deft acoustic guitar solo behind Carolyn’s spiteful vocal directed at a feckless lover whom she advises would be better off attempting the title sentiment than holding out hope she’s going to take him back. And not to take anything away from the lovely, atmospheric ballad, “Lonesome Whistles,” featuring a tender, heartbreaking vocal by Carolyn, but the title track is the album’s most beautiful, affecting moment. The Donna Hughes song is suffused with the longing and profound ache Hughes delivers as well as any writer, and Nu-Blu makes it work by trimming down its instrumental attack, leaving only Luck’s mournful fiddling and Daniel’s stark acoustic guitar picking to craft a stark, abject soundscape for Carolyn to offer a stirring, restrained reading that packs a punch by being so controlled. The song is a keeper, and so is the entire album. Figure on Nu-Blu hanging around for awhile.